Whereas the potential inference from any single neuroimaging study is limited to method-inherent drawbacks, the high degree of standardization in neuroimaging research allows to pooling and integration of activation results from several thousends of experiments. Moreover, several large-scale databases of neurimaging results have emerged over the last years, that compile thiswalth of information. 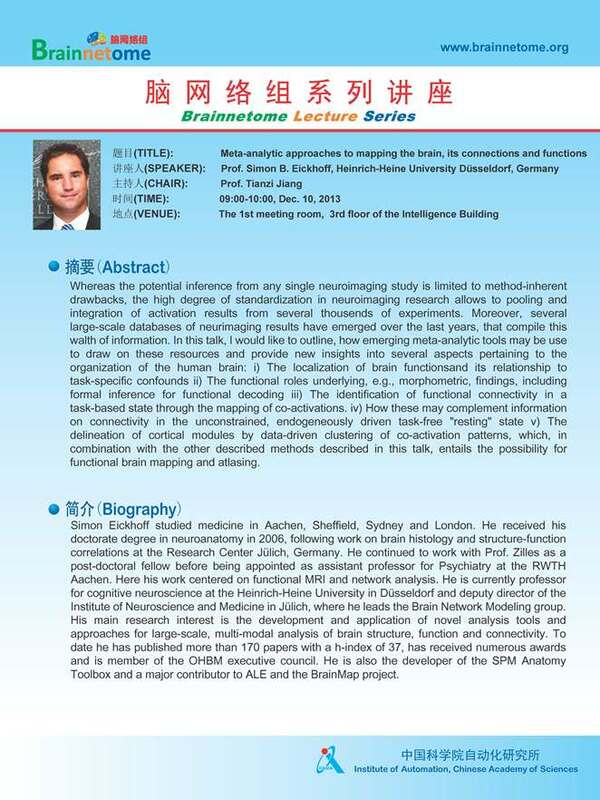 In this talk, I would like to outline, how emerging meta-analytic tools may be use to draw on these resources and provide new insights into several aspects pertaining to the organization of the human brain: i) The localization of brain functionsand its relationship to task-specific confounds ii) The functional roles underlying, e.g., morphometric, findings, including formal inference for functional decoding iii) The identification of functional connectivity in a task-based state through the mapping of co-activations. iv) How these may complement information on connectivity in the unconstrained, endogeneously driven task-free "resting" state v) The delineation of cortical modules by data-driven clustering of co-activation patterns, which, in combination with the other described methods described in this talk, entails the possibility for functional brain mapping and atlasing.